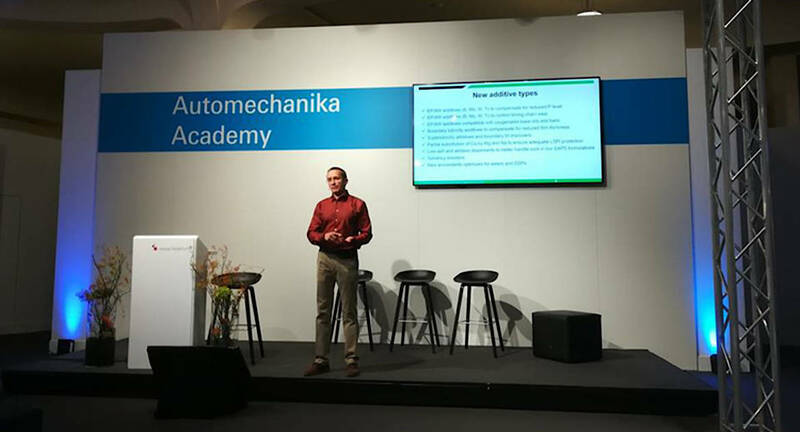 This fall, we are proud to have been admitted to make a presentation at Automechanika Frankfurt 2018 as part of the Automechanika Academy at the Innovation Hall sponsored by Porsche. Prof. Boris Zhmud, BIZOL Head of R&D, presented his outlook on the future of motor oils in the era of e-mobility. We were also delighted to watch how this presentation spurred an intense debate in media regarding the environmental impact of e-mobility. Facing the need to meet the new fleet-average emission targets, car builders opt for powertrain electrification. 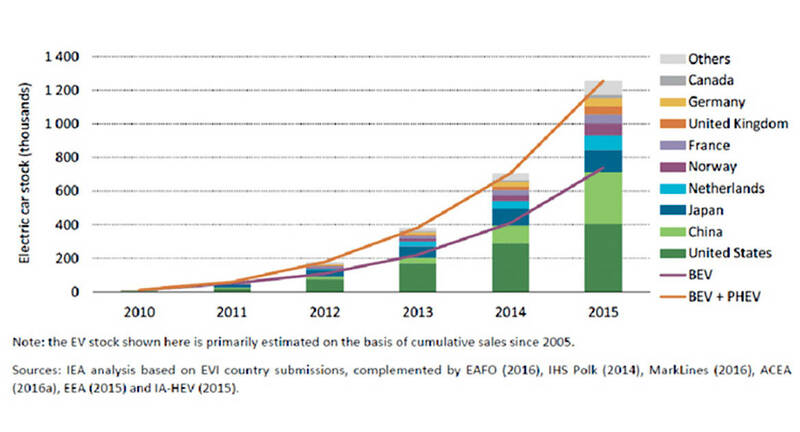 E-mobility proponents believe that the time for a move away from fossil fuels has come. This raises concerns among lubricant manufacturers about the future of motor oil. Zhmud points out that, as it stands now, electricity generation globally is far from being CO2 neutral. For instance, in Germany, each 1 kWh of electricity comes with a 520 g CO2 penalty in terms of GHG (greenhouse gas) emissions. This is not surprising since the German electrical grid is largely dependent on coal. 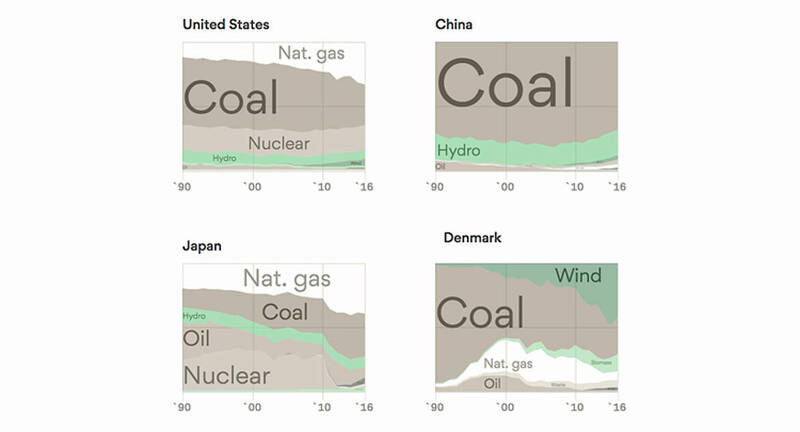 The following diagram shows the share of total electricity generation from different sources for the USA, China, Japan and Denmark. 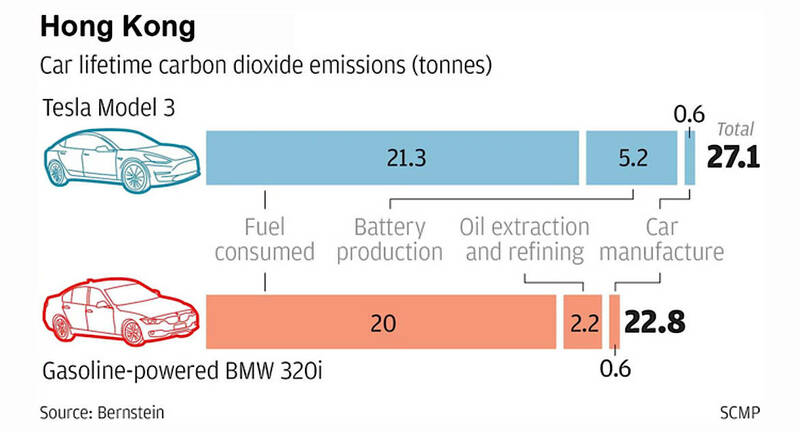 Another important factor undermining the “zero-emission hype” is the embodied CO2 footprint of electric vehicles due to energy consumption during their manufacture. 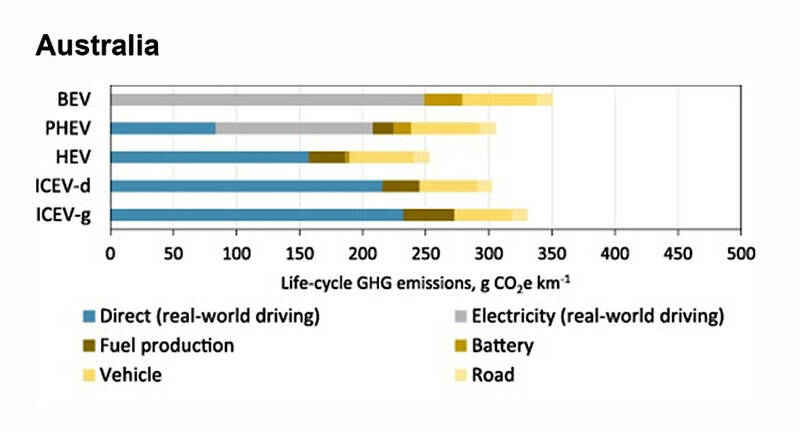 Several studies have recently been carried out comparing the life cycle of GHG emissions from ICE-powered cars and their battery-powered analogues. These prove conclusively that the benefits of powertrain electrification cannot be fully realized until a green electrical grid becomes globally available. Furthermore, a logical question arises: what is the driving force behind all this e-mobility fuss? The answer is simple: politics. For instance, a hybrid Porsche sport sedan capable to deliver 500 hp manages to score well under the 95 g CO2 / km limit in the official WLTP test. In the engineering community, this is called “beating the test” since the “official” figure doesn’t have to correlate with the life-cycle analysis results. At the same time, electrification does indeed help reducing pipeline emissions from vehicles in congested city traffic, and already for this reason alone, should be viewed as a positive development from the environmental perspective. In future, when a cleaner electrical grid is created all around the world, e-mobility will indeed become a viable contributor to global GHG emission reduction. Unfortunately – for economic reasons – this is not likely to happen until humankind gets short of fossil fuels having used them up completely. Hence, the good old internal combustion engine (ICE) will remain in service for decades to come. Hybrid powertrains are expected to dominate in new vehicle sales by 2040, with more than 80% of vehicles in use still featuring an ICE even then. This addresses concerns of lubricant manufacturers that the change to e-mobility means the end for their business. This will not happen in the foreseeable future, at least. As a matter of fact, the demand for high-quality synthetic lubricants is poised for growth. This growth is necessitated by increased sophistication of future ICEs that demand higher quality lubricants. 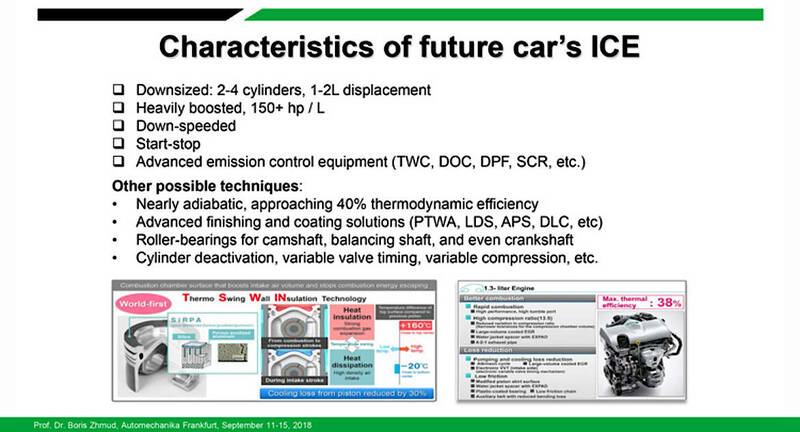 The main features of future automotive lubricants are dictated by technological trends in the automotive industry, including a growing hybrid electric vehicles stock, increased ICE power density due to downsizing and boosting, universal acceptance of start-stop function, better fuel quality and mandatory use of renewable and/or oxygenated fuels, tougher emission regulations, use of new exhaust after-treatment systems such as DPF, DOC, SCR, LNT, TWC, GPF, etc., new materials used to achieve friction reduction and light-weighting, and so on. 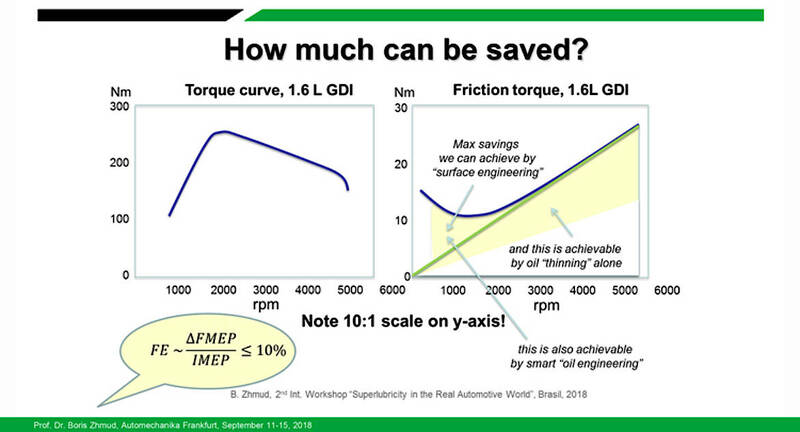 An important development focus will remain on improving powertrain efficiency. As a matter of fact, by improving the thermodynamic efficiency of the ICE and by reducing powertrain friction, one can achieve 20-30% reduction in CO2 emissions using already available technical solutions. 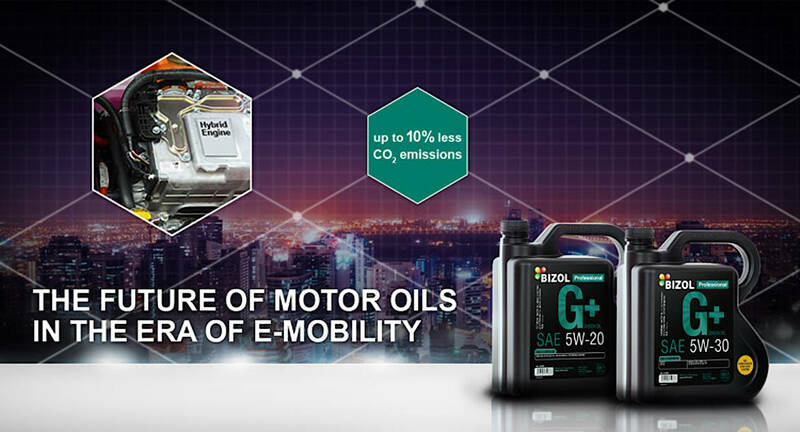 The lubricant development alone can bring up to 10% reduction in CO2 emissions. These figures compare favorably with what is brought by powertrain electrification when using the existing “dirty” energy mixes. At BIZOL, we have taken a conscious strategic decision to focus on premium-grade full-synthetic lubricants leaving the rest to competitors. The current trends in the lubricant business prove the righteousness of this move. In the coming era of e-mobility, our future looks brighter than ever. Prof. Zhmud will continue discussing these hot topics at the European Base Oils & Lubricants interactive Summit 28 - 29 November 2018, Florence, Italy.